I noted back at the beginning of the month that Berkshire Hathaway (BRK) shares were showing signs of fatigue, and that a rudimentary eveningstar pattern had formed on the weekly chart. The eveningstar pattern is a three day reversal formation consisting of a large white candle, followed by a narrow opening and closing range doji candle, and completed by a large dark candle. It reflects a bullish to bearish transition in investor sentiment and is often seen at market tops or important levels of technical resistance. 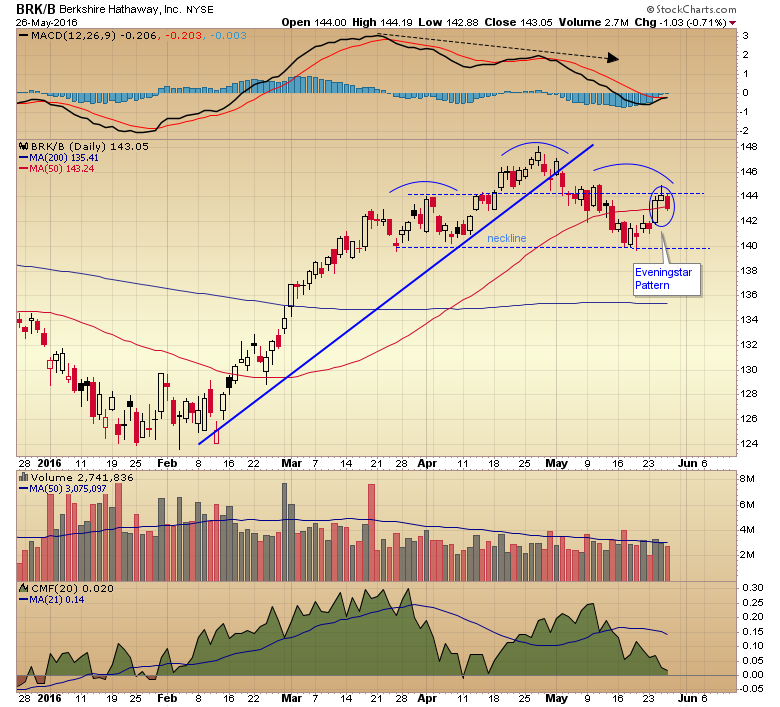 Since that time, the stock has moved back into a zone bordered by $144.00 resistance and $140.00 support. The weak close on Thursday formed a large dark candle resting on the 50 day moving average and completing another eveningstar pattern, this time on the daily chart. This second pattern formed at the top of the right shoulder area of a head and shoulders reversal pattern that has been under construction for the last three months. There is a high degree of correlation between Berkshire shares and the S&P 500 index but it remains to be seen if these ominous formations reflect underlying issues in the index and are a precursor to weakness in the broader market.